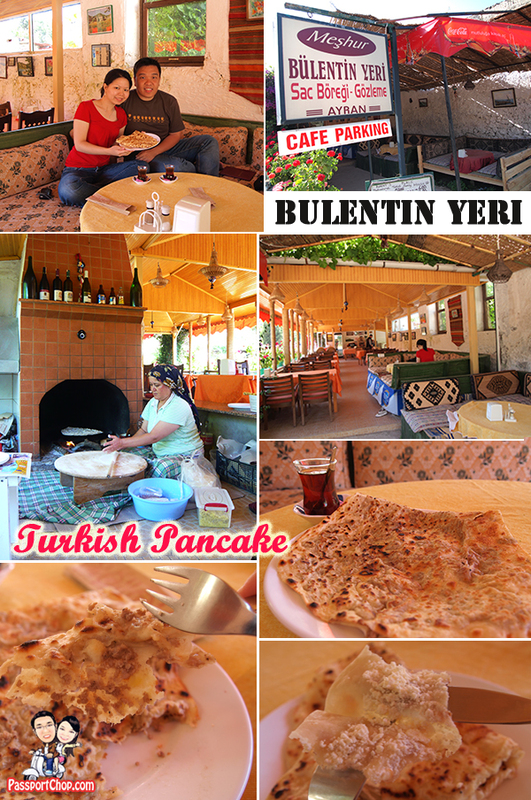 The best thing to complete a long day of trekking around the ghost town of Kayakoy is with Turkish Pancake Gozleme at the nearby gozleme shop Bulentin Yeri (about 5 minutes walk from the entrance to Kayakoy). Gozleme is a traditional Turkish filled pastry bread with ingredients such as spinach, feta cheese, mushroom, chicken and minced and diced meat. We were the only customer in the restaurant at that time – we chose to sit and eat in the traditional style – in a huge booth with lots of cushions. Gozleme is essentially a huge pancake stuffed with any ingredient you like and in more touristy areas, to cope with the huge crowd, its usually just heated pieces of refrigerated pancakes but in this restaurant, the staff made the pancake from flour heated on a hot stone pan. We ordered a chicken and a cheese gozleme. The fillings are basically minced meat pieces and cheese powder. This quick meal is combined with apple tea (very sweet) and mint tea for an enjoyable and relaxing late afternoon snack. This restaurant also offers a good view of the Kayakoy village at the hilltops – do a walk around this area too and you will be able to find some of the Kayakoy stone houses being rebuilt to be used as private houses with beautiful gardens.